My great-grandmother introduced me to this classic candy over 30 years ago. 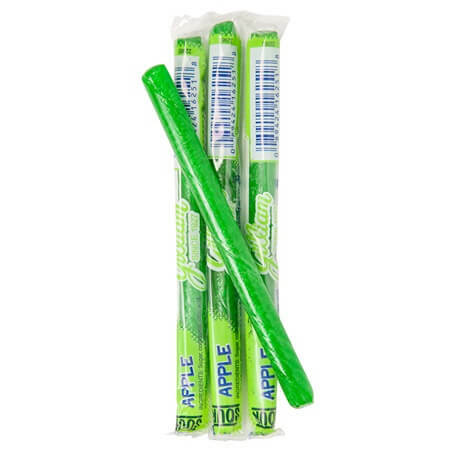 Sour Apple Old Fashioned Stick Candy has been around for many years. I remember the joy of getting change from my parents and then getting to choose a candy stick from all the choices. 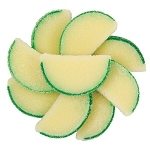 The fun colors of this barber pole candy would gleam inside glass candy jars. After the thrill of picking my favorite, the excitement would continue as I ate my stick candy. Best of all, this candy lasted and lasted. Bring the fun back to your shop. Order today! DISCLAIMER: Due to the fragile nature of this product and delivery circumstances outside of our control, we will not guarantee that stick candy will arrive unbroken. The shipping process can often cause some or many sticks to break. We package them as carefully as possible to prevent breaking, but we will not be held responsible for any broken sticks regardless of how many are broken. Please be aware of this policy before placing an order. Thank you for understanding!